This is Panel 13 from last summer’s Comics & Medicine conference in Toronto. In this episode we will hear from three speakers in two presentations. Both will address medically-relevant themes as they have appeared in mainstream media comics. An overt focus on the effects of illness is still rare in mainstream syndicated comics. One of the few examples can be found in the “Funky Winkerbean” comic strip, by Tom Batiuk, which not only highlights a woman’s ultimately terminal experience with cancer, but also provides great insight into how the illness experience affects her husband, who must learn to be supportive of her needs while not sublimating his own. (The collected strips were published as a book titled Lisa’s Story: The Other Shoe.) Using a broad discourse analysis framework, we examine how his feelings, needs, words, and actions evolve, intersect, and interact with each other and with this situation. Sarah Russe is a scientific director at Discovery Chicago where she specializes in community advocacy projects. She holds a master’s degree in linguistics from Northeastern Illinois University, is completing another in Bioethics & Health Policy from Loyola University, and is committed to exploring the synergies between these two fields. Judith Kaplan-Weinger is professor of linguistics at Northeastern Illinois University in Chicago where she teaches courses and conducts research in discourse analysis, anthropological linguistics, and sociolinguistics. Her current research focuses on the linguistic and visual semiotic analysis of texts of loss, grief, and mourning. “Between Friends” is a slice-of-life comic strip that features three forty-something women friends and is syndicated worldwide by King Features. 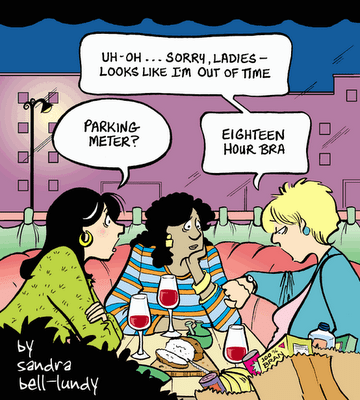 It is primarily a humour strip but because it is reality-based, Sandra occasionally writes sequential story lines that explore serious issues relating to women. Sandra will show selected strips from the story arcs about fertility and about domestic abuse and discuss the influences behind these comics as well as reader reaction. She will also show cartoons featuring her “Between Friends” characters that were created specifically for the Canadian Cancer Society for their campaign to promote mammograms. You can watch the animation of these strips here. Canadian cartoonist Sandra Bell-Lundy is the creator of the comic strip,”Between Friends”. Her strip is syndicated by King Features to over 175 newspapers in North America as well as ten international countries including India, Saudi Arabia and Australia. “Between Friends” has been anthologized in two book collections and has been featured in a Canadian Cancer Society campaign to promote regular mammograms.